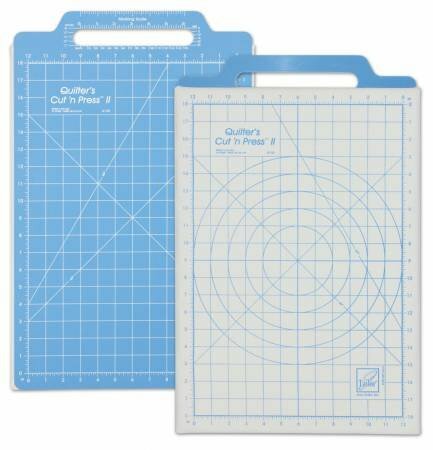 Two sided cutting mat and pressing surface all in one great quilting tool. • Cut, press and square the smallest quilting pieces with complete accuracy. • Hard, weather-safe cutting mat provides superior durability and extended blade life. • Thick, bonded, cushioned side eliminates seam-edge impressions and protects the raised details of fine appliques. • Diagonal lines on both sides for easy mitering and bias cutting. Great for the pressing and cutting surface on my Making Fish pattern! Due to this products size and shape a surcharge has been added to make up for the shipping cost. If your order is going to total more than $ 200.00 please call the shop and we will honor the shop price of $ 53.00!